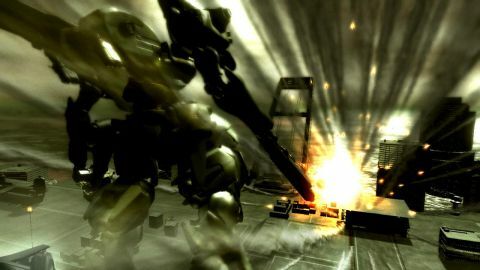 Like Paris Hilton without a camera nearby or C3-PO without plucky sidekick R2-D2, Armored Core 4 is a fantastic giant mech construction sim left incomplete because it just can't find its reason for living- a decent action game. There are a gazillion destructive weapons to bolt onto your rig: bazookas, plasma cannons, sniper guns, energy swords, guided missiles... and even more standard parts, ranging from various heads and legs to missile-jamming ECM generators. You have to monitor each part's weight and energy consumption, and even counter-balance your mech so that it isn't lopsided. Did we mention the custom paint-jobs? But after all this is done, you're launched into a lackluster single-player story mode that has very little actual story (future mega-conglomerates fighting one another with mercenaries) and whose 35 or so missions tend to last one-to-three minutes apiece. And though there are a few flashes of brilliance, overall, these are typical blast-em or protect-em assignments with visuals that look next-gen average. That's just not a lot of game. What it does have a lot of are little irritations. It's tough to tell how much parts cost, or even if you own them already. Your target lock can't easily cycle to the next target, so it often gets stuck on the meaningless enemy beside the mission-critical target you want to kill. The camera often sits directly behind your mech, so you block your own view. Your mech can fly, but has to jet-boost over an ankle-high step. Description A fantastic giant robot construction kit that just can't find a decent action game to make it complete.